un’s palace is called Pabellón de las Artes. And what is the connection? We’ll have to enter Jun’s Pavilion of the Arts to find out. A massive iron door slides open easily, and we enter a bright, spacious museum that, in the distance, curves to the left, leaving the last part out of sight. Lining the walls and filling the floor-space are more than a hundred ceramic vases, jars, jugs, plates, oil lamps and chests, from the gigantic to the diminutive. Gracefully shaped, colored and gilded, decorated with intricate geometric, floral and calligraphic designs, all are in the 14th- and 15th-century style of the Nasrid period whenthe Alhambra was built: the last 200 years of Muslim rule, when the arts in southern Spain flourished as never before. Anyone with an interest in Andalusian history entering here would rub his eyes in disbelief and delight. Nearly all these ceramic pieces are lusterware, made by a complicated process that was gradually lost from this land after 1492, when the Muslims were finally expelled from Spain following the Christian conquest of the Kingdom of Granada. Ceramics with this transparent, metallic overglaze are called loza dorada (“golden pottery”) in Spanish, though, strictly speaking, the pieces may be any of several tints—both silver and gold tinged with green are common. The earliest lusterware was created at the beginning of the ninth century in Basra and Chuff, in what is now Iraq. Soon afterward, the artisans of Samarra, 125 kilometers (75 mi) north of Baghdad on the Tigris River, started to create large quantities to supply the courts of the Abbasid Caliphate, from India in the east to Al-Andalus —Muslim-ruled southern Spain—in the west. The technique also soon flourished in Egypt. From there, some two centuries later, artisans of Al-Andalus learned enough to start their own production, reaching their apogee of beauty and sophistication in the period of the Alhambra. Complex lusters, he says, may require firing more than once—and some as many as six times. Very few examples of the old lusterware have survived the last five centuries. One of the most famous is the enormous, amphora-shaped “Alhambra Vase” (also known as the “Vase of the Gazelles”), and a replica of it is a centerpiece in this Pavilion. Were I to make a guess as to how long it would have taken an artisan of Al-Andalus to produce it and allthe rest of these riches, I would suggest a couple of lifetimes. And he’s filled his Pavilion only not with his art, but also a huge studio, an auditorium and research facilities. A stone’s throw away, he runs a small factory that employs 24 people to produce the kind of decorative Andalusian pottery found in local shops. It is a separate world from his Nasrid-style lusterware, whose prices range all the way from € 100 to € 60,000 ($120–$72,000). Son of a simple granadino potter, Jiménez got clay on his hands as soon as he could crawl. By seven he was throwing pottery. What set his artistic passions afire more than 30 years ago was the discovery of the sensual loveliness of the old Andalusian art. “When I contemplated the vases of the Alhambra, I decided that I wanted to do this, and I started to research and study,” he says. The path he took was very different from that of his father. The task was gigantic: Jiménez studied chemistry, and he visited Nasrid masterpieces worldwide. There are, he says, no original, firsthand written sources. From Nasrid times, only the bare names of a few ceramists have been found—Suleiman Alfaqui, Sancho Almurci, Hadmet Albane, Felipe Frances, Abdul Aziz, Abel Allah Alfogey. Of their techniques, there is nothing. 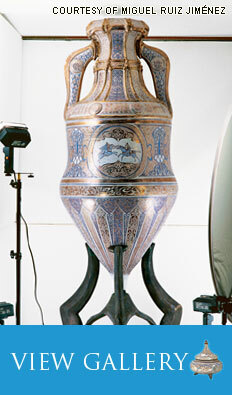 To recreate the Nasrid masterpiece style, he found clays and minerals both locally and as far afield as China, South Africa, England and France. Over four decades he studied the materials, built Arab-style kilns and fired them to reach temperatures up to 1040 degrees Centigrade (1904°F). (Examples of Arab-type kilns can still be found in ceramics centers such as Paterna and Manises.) For as long as anyone knows, the potters of this region have used “mountain wood”—thyme, rosemary and gorse—to achieve high temperatures and just the right kind of smoke. Jiménez used the same, varying his materials, varying his temperatures, shifting the placementsof objects inside the kiln. Then, for a masterpiece like the Alhambra Vase, which weighs about 100 kilograms (220 lb) and stands 1.5 meters high(4' 10"), the throwing is itself a process no less mind-boggling that may take Jiménez as long asa month. During this time, the upper part must never be allowed to dry out, lest it become impossibleto join with the other parts, while the lower parts must gradually dry in order to support the weight ofthe top parts. “You humanizethe piece with your hands,” Jiménez says. “You mark on the vase your impressions of humanity and sentiment, mastery and culture.” It was this attitude, he believes, that enabled him to match themaster craftsmenof Al-Andalus. The more I lookedinto how Jiménez works, the more I saw a spiritual dimension in his art. The relationship between him and clay and fire, though based on years of observation and science, incorporates at least as much feeling and intuition, of the kind that comes from a master’s understandingof each step along a complex path. These days, Jiménez’s meditations arebroken most often by his cell phone, which interrupts him with questions from customers, family, friends and foremen in the factory. Watching him mademe wonder where Michelangelo would have got to had he possessed a cell phone. In order to focus Jiménez’s attention for a talk, we went to lunch—phone off—in a popular village restaurant. Tor Eigeland (www.toreigeland.com) has contributed writing and photography to Saudi Aramco World for more than 30 years. He lives near Toulouse, France. This article appeared on pages 2-9 of the January/February 2006 print edition of Saudi Aramco World.